Driven by the new A6 processor, LTE 4G high-speed modem and Retina display with in-cell touch technology, the new iPhone 5 is estimated to cost Apple $167.50 in materials alone for the entry-level 16-gigabyte model. 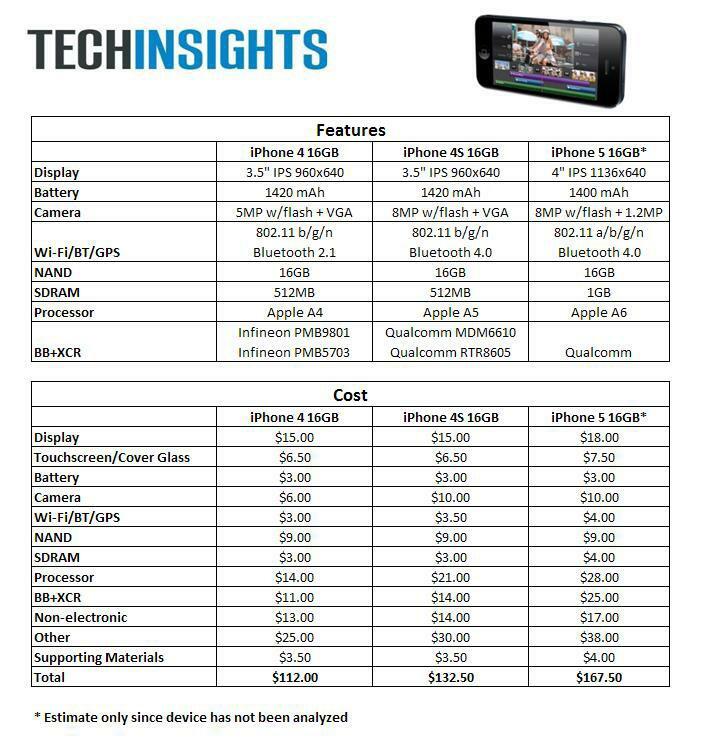 The numbers, published on Friday by UBM TechInsights, peg the cost of the new A6 chip at $28, making it the most expensive component in the new iPhone 5. The new, larger 4-inch display was valued at $18, plus another $7.50 for the touchscreen and cover glass. The new 4G LTE modem from Qualcomm is also one of the most expensive components of the device, estimated to cost $25 by UBS. The new, thinner camera is also valued at $10, while the NAND flash is $9, and SDRAM is $4. The handset's Wi-Fi, Bluetooth and GPS chip is estimated to cost $4. Of course, the bill of materials for the iPhone 5 does not include the research and development costs Apple invested in the hardware, as well as development of iOS, or the cost to assemble, package and ship the handset. The 16-gigabyte iPhone 5 is available for $199 with a new two-year service contract. The UBS data is based on assumptions about the device that cannot be verified because the hardware has not been analyzed. The research firm presumes the new A6 processor has a gigabyte of RAM, and that the internal battery is 1,400 mAh. For comparison to the iPhone 5, UBS estimates that the 16-gigabyte iPhone 4S, which sells for $99, has a bill of materials of $132, while the iPhone 4 is valued at $112.